While a lot of televisions rattle off specs to make them appealing for PC gaming, and a lot of PC manufacturers shrink down their systems so they’ll fit in your media center, there’s still been one major issue with the concept of PC gaming from your couch. The Razer Turret bridges the gap between your PC and your couch nicely. It’s just a keyboard and a mouse—peripherals that aren’t a big deal, but there’s a lot of thoughtfulness in the design that kicks it up into the realm of “must haves” for a very particular kind of person: the couch gamer. Steam did a great job of making things a little simpler with its controller last year. It gave you some of the flexibility of a mouse while still being a controller. It was easy to hop into most games and just get to playing. But when you’re playing an aggressive shooter, like Battlefield, or a strategy game, like Civilizations or StarCraft, a controller is still excruciating to use. It’s just too damn slow. You need a keyboard and a mouse. A keyboard and mouse are also useful if you’re trying to do other things, like browse the internet, convert that old Raspberry Pi into a home theater PC, or Slack from the comfort of your couch. For any activity that requires inputing text a controller isn’t going to cut it. Logitech has been the primary name in the couch keyboard game, and its Logitech K400 is exceptional. Particularly because it integrated a touchpad into the keyboard—eliminating the need for a surface to put a mouse on. It’s also very cheap, just $30 versus the Turret’s premium price tag of $150. But the K400 is still awful for gaming for the simple reason that touchpads are awful for gaming. If you want something better you’re going to have to pay for it. Razer’s Turret ignores the touchpad trend, and instead folds in a sturdy mousepad instead. Just flip it out and get to mousing. The Turret mouse itself is a very solid 4-button affair. While MMORPG gamers might not be crazy about it, the majority of users will have few complaints. And it all feels natural to use. I (finally) finished Firewatch without ever feeling cramped or irritated by the Turret. My only issue was the one I find with my laptop and tablet too—where do I put the damn thing when I get up off the couch. For temporary departures from couching, you can just drop everything right where you were sitting. For longer term storage, Razer includes a sleek-looking dock setup to keep the mouse and keyboard out of the way when not in use. Another benefit: the dock charges the peripherals too! It’s such a silly thing to finally sell me on a couch keyboard, but it’s also crucial for anyone seriously investing in their home theater setup. Juggling remotes and controllers is bad enough, but throwing in a keyboard and mouse makes everything worse. These objects need a place to live when they’re not on you lap, and Razer’s helpfully provided a dual-purpose home with a small footprint. The whole setup runs over 2.4GHz wireless or Bluetooth, so it’s not difficult to configure, and there are no garish LEDs to tweak with downloadable software. The Razer Turret is pleasantly simple—which is all most of us need from a keyboard were gonna balance on our knees while we game from the toilet that happens to be in line of sight of the bathroom couch. Included dock makes charging easy and keeps everything out of the way when not in use. It can run on either 2.4GHz and Bluetooth so there’s never issues with connection. 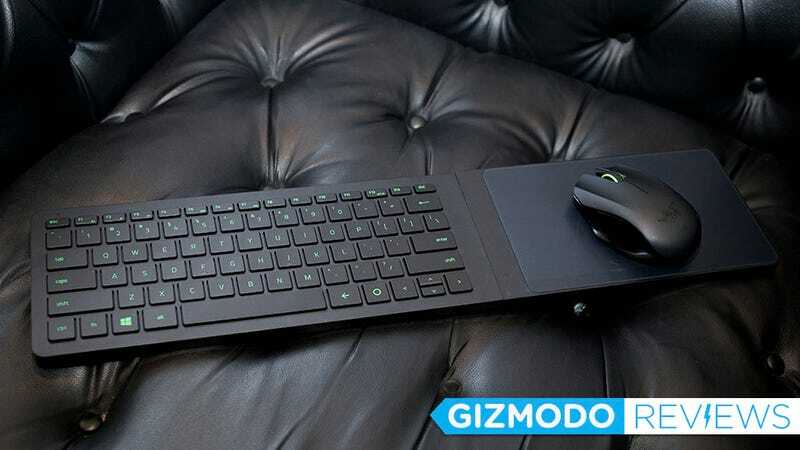 It’s a keyboard and mouse you balance on your lap, and it’s not terrible. If you’ve ever needed such a set up there is nothing better currently available. It’s $150, which is a real kick in the pants.